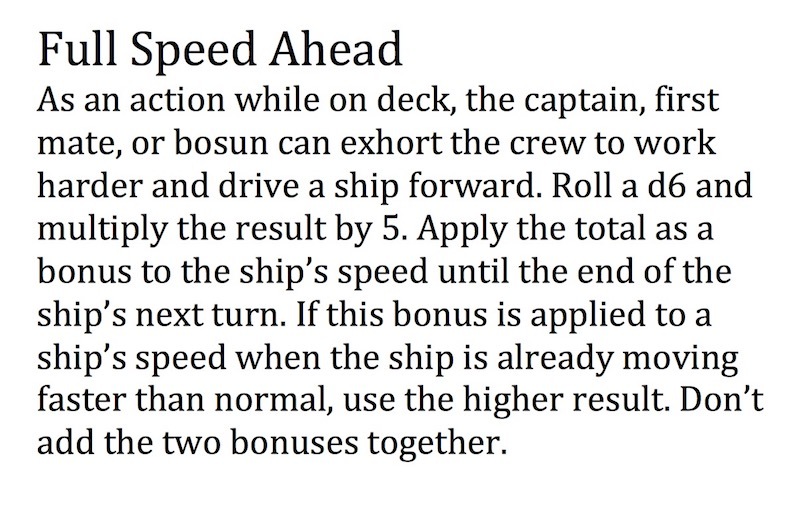 The latest Unearthed Arcana added some fairly comprehensive naval combat rules, here’s a look at how ships cross in the night (while shooting ballistae at each other). Naval Combat in D&D is an interesting mix of ships crashing into one another, ballistae and mangonels firing, while boarding parties clash in a desperate struggle to stay afloat. All of this to say, there are a lot of moving parts in the new Naval rules that are up on Unearthed Arcana right now, but, they fit together seamlessly with just a little bit of practice. Let’s take a look. One of the best things about 5th Edition is the streamlined platform the rules have built. Many things just work the way you’d think they do–the errata released recently do a lot of clarification for people who are sticklers for correct wording–but this is just to reinforce that things work the way you think they do. And Naval Combat works a lot like you think it might. Ships are a bit like a mount that can carry many riders. As we talked about last week, they each have their own stat blocks, list of officers, and in combat, act on their own initiative. Much like a mount, they act on their initiative modifier–as a reminder a ship’s crew acts as a modifier to some of the ship’s actions which can range from -10 to +10, starting off with a +4 representing a fresh, trained if not experienced, crew. Of the myriad officers on a ship’s roster, the ones that matter most in combat are the Captain and the First Mate or Bosun. These officers have access to special actions that can be taken on their turn. This helps one of your ship’s weapons hit–and you’ll usually want to be firing a ship’s weapon in combat, because against large targets like these (which often feature a damage threshold) the average crewmember or lower level party member won’t be doing much. And this will help you either stay out of range of your opponents weapons, or close the gap. 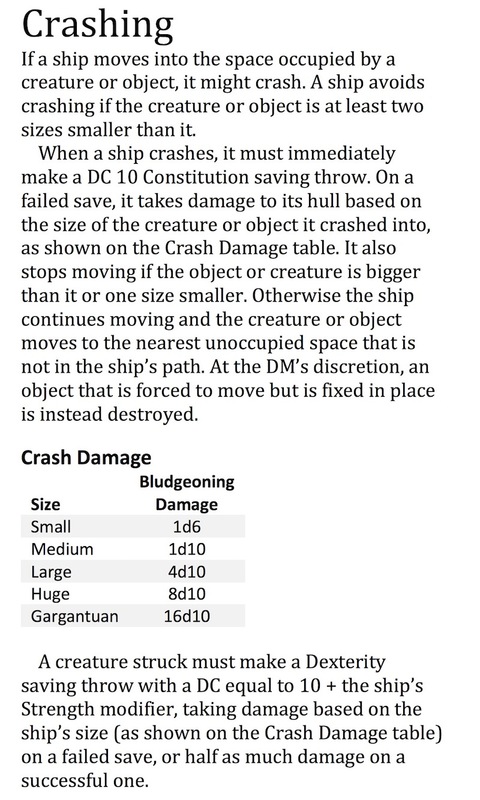 For reference here’s one of the stat blocks from the rules, so we can see what goes into a ship. So let’s say two airships, the Azure Assailer and the Blue Bulwark are clashing with one another. Each rolls initiative, with the Azure Assailer eking out a lead. Its daring captain brings it into range against the Blue Bulwark and decides the ship will fire all 4 of its ballistas at the Blue Bulwark. The first mate uses Fire At Will to give one of the Ballistas advantage, and its attacks pierce the Blue Bulwark’s hull. The Blue Bulwark, in kind responds by targeting the Azure Assailer’s Helm, which has an AC of 16–tricky to hit, but with the Blue Bulwark Bosun declaring Fire At Will, 3 out of the 4 shots land and, with a bit of luck, destroy the helm. The Azure Assailer is in dire straits now–but this is where the rules get real fun–though the ship can no longer turn, you can instead try to make emergency repairs or reach the opposing ship with grappeling lines or other things to keep them from escaping. And if you can get close enough, that’s a great way to bring Boarding into the mix. Boarding isn’t really spelled out separately, because it’s just a normal fight, only its one that takes place on the confines of a ship, whose space is already defined. Crew vs. crew with the players in the mix, for certain–and when it all comes to a head one ship might go crashing into something else. Which can be fun. 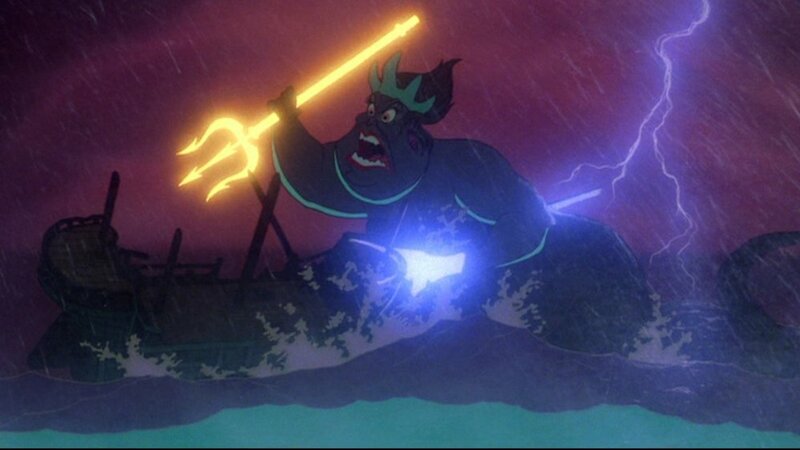 Note the creature struck part–because the game fully expects you to go crashing into Kraken, slamming into sea serpents, and so on–usually with the aid of a Ram, which takes most of the damage and deals it instead to the creature. So you too can live out your wildest Prince Eric fantasies. And that’s combat in a nutshell. But there’s so much more you can use a ship for. There are nautical events, a whole section on naval travel–even complications for the care and maintenance of a ship. 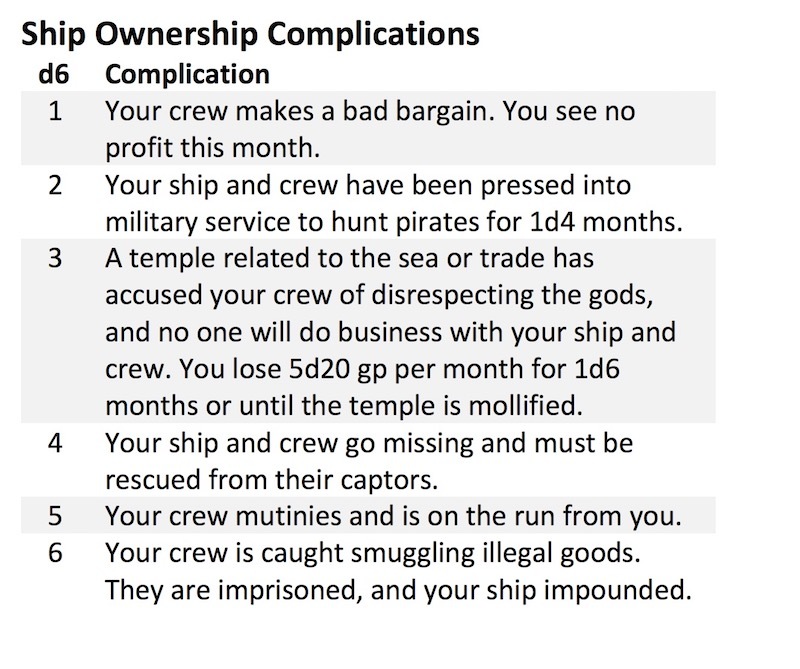 The upshot of it all is, these rules layer in a little more immersion in the game, giving players and their characters ships to sail and places to aim them at. Again, despite the fact that there are definitely rules for airships, Spelljammer is definitely not confirmed for next year. So. Keep that in mind, and enjoy your week.